EDITORIAL – The attack on the U.S. consulate in Benghazi that led to the death of the American ambassador to Libya, Christopher Stevens, illustrates that despite the poor performance of Islamists in the elections back in July, the country still faces a serious internal terrorist threat from ideological militants who either operate with freedom from central government control or have entered into the ranks of the new Libyan security forces. I had already warned about the latter phenomenon in particular as regards attacks on Sufi shrines in Tripoli and Zintan that were suspected to be the work of members of the security forces. 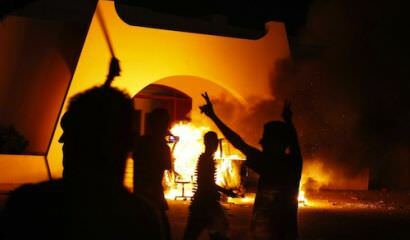 Concerning the assault on the U.S. consulate in Benghazi, two American intelligence officials revealed to the Daily Beast that members of an Islamist militia known as the February 17th Brigade were responsible for safeguarding the consulate, but apparently stepped aside in anticipation of the attack, possibly on the urging of an Islamist politician. The Libyan government is now trying to integrate this militia — along with another by the name of Rafallah al-Sahati — into the security forces by appointing army colonels to lead them, but such a move is not likely to do away with the problems posed by these Islamist militants. On the contrary, they will simply use their new positions to push their own agendas, just like the Islamist members of the security forces who have desecrated Sufi shrines. There is also the potential here to trigger some infighting among the new security forces. The greatest risk is in the east of the country where Islamist influence is strongest, even as Islamism may not necessarily be the dominant political force on the ground. Indeed, the Libya Herald recently reported that clashes broke out in the eastern town of Marj among members of the new National Army, with no fatalities but several wounded and requiring treatment in the local hospital. While it has not been fully ascertained what caused this infighting, it is not unreasonable to point to politicization of the ranks of the security forces. On the other hand, a possible mitigating factor exists in the fact that there is a good deal of local resentment against Islamist militants in particular, as evinced by a demonstration in Benghazi numbering some 30,000 protestors, who denounced the attack on the U.S. consulate and called for the disbanding of militias throughout the country. Commentators like Michael Young of the Beirut-based Daily Star interpreted the success of the assault as evidence of widespread anti-American sentiments in Libya. Yet the large demonstrations in opposition to the attack — as well as a subsequent assault by several hundred protesters on the headquarters of an Islamist militia known as Ansar al-Shariah (suspected of links to the assault on the consulate), which then evacuated its bases in Benghazi — illustrate that this assessment is not wholly accurate. At least in Benghazi, there is still considerable gratitude to NATO for its aid in the downfall of the Gaddafi regime. In a way, the backlash was predictable, for a precedent existed in Rajma — a town located some 50 km southeast of Benghazi — where residents repelled an assault on a Sufi shrine by Salafists, without the aid of the security forces. However, in Benghazi itself, members of the security forces took advantage of the anti-militia sentiment and thus gained control of the bases evacuated by militias that were that were the targets of protesters’ anger. Yet I say “possible mitigating factor” because there are two further considerations to bear in mind. First, the anti-militia sentiment displayed by the protesters could create a security vacuum, entailing attacks on militias who have no links to Islamists and are innocent of any wrongdoing (as has already happened), and on members of the security forces who may be wrongly suspected of aiding militias or Islamist militants. Second, the militias that have disbanded have not necessarily given up their weapons. They could instead decide to operate underground as small insurgent units. In short, what emerges from an analysis of the attack on the U.S. consulate in Benghazi and the aftermath is neither a simplistic narrative of an imminent Islamist takeover nor a Manichaean story of a heroic victory for moderate Muslims against Islamists in Libya. Rather, it is evident that the problem of infiltration of the security forces by ideologues still exists. When we also consider the potential for the anti-militia violence of protesters to become too generalized and the fact that disbanding does not automatically translate to giving up one’s weapons, it is logical to conclude that a serious terrorist threat within the country is likely to persist for a minimum timescale of months to come, with low-level violence in the form of insurgent bombings and shootings, mob attacks, and internal clashes among the security forces. Aymenn Jawad Al-Tamimi is a Shillman-Ginsburg Fellow at the Middle East Forum. This article is reprinted with permission of the Middle East Forum. Just leave the middle and lot the savages kill them selves.